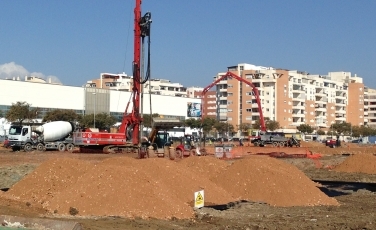 Spanish sub-contractor, Menard were recently contracted by Ferrovial Agroman Sau to undertake soil treatment controlled by modulus columns at Racket City in Malaga. Designed by Luis Machuca Y Asociados, Menard commenced soil treatment by Controlled Modulus Columns under triangulated meshes of 2,50m and 3,20m sideways along of the sports courts which were settled on loose flood plains formed by sandy clays and beach sand. The inclusions reached depths from 8 to 11m placing the tip on a level of sand and gravel from medium to dense compactness (N> 20 strokes). The project which cost a total of €28,695,408 used loose soil treatment to limit settlements of flexible elements with an angular distortion below 1/1000 for the functionality of the sports courts. The total execution was 16.900ml, with an average performance of 500ml per day. The project was completed in March 2015.